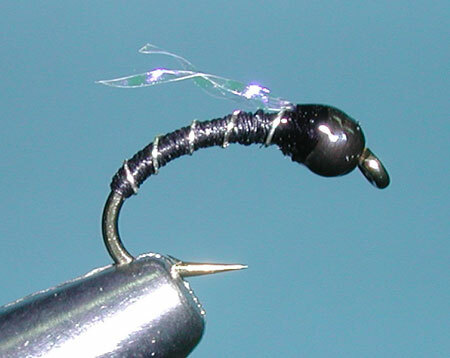 Chironomids are one of the most important food sources in stillwaters. They can represent 25-50% of the food source for trout, depending upon season. There are three stages to consider, the larvae, pupa, and emergers. Colors range in frequency from Black, Brown, Red, Tan, Green, and Cream. Many of the larvae will have a reddish appearance as they retain hemoglobin within the oxygen-poor depths. These larvae are often called bloodworms. The larvae are also quite larger than the pupa or emergers, sometimes up to two hook sizes. 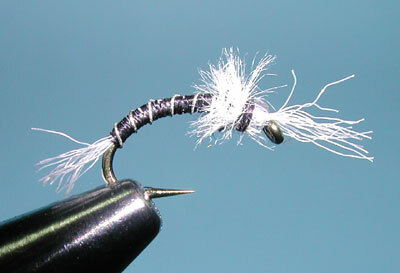 Generally, the largest chironomids will be during the Spring and will decrease in size through the Summer and Fall. The Zebra Midge pattern is acclaimed to have orginated around the Lees Ferry area of Northern Arizona, along the Colorado River, by Ted Welling, a guide with Lees Ferry Anglers. It is very common throughout the Eastern Sierras and up into British Columbia as a Chironomid pupa pattern for Stillwater Lakes. 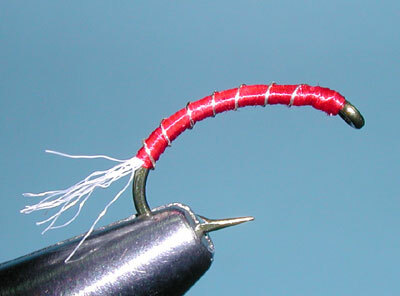 Larvae patterns can be created by omitting the beadhead or by using a black microbead. 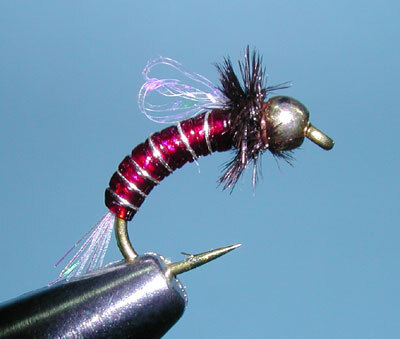 The Olive Zebra Larvae is often used on the Lower Owens for a caddis larvae pattern.The emerger patterns will have a small tuft of Antron protruding from the bead and a herl or dubbed collar. 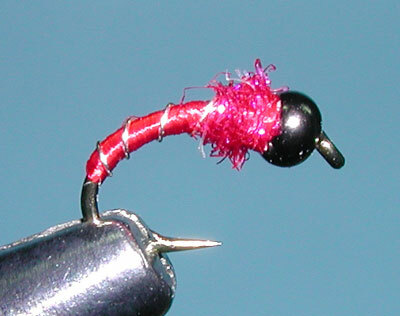 The Zebra Midge is usually a thread body of Black, Red, Olive, Brown, and Gray color with a fine silver wire ribbing. It can have a beadhead of Nickel, Copper, Gold, Black, or a Glass Bead. Sometimes, there is no beadhead and a head of rabbit or beaver dubbing is created instead. 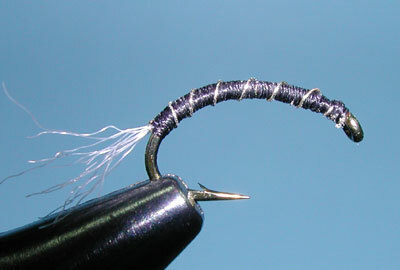 Zebra Midges are generally ribbed with Silver Wire. Sometimes, if a Copper Wire is used, the midge might be referred to as a Tiger Midge, as in the Eastern Sierra. 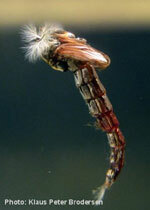 Idylwilde Flies is marketing a copper ribbed Zebra pattern that they call Crystal Dip. It is also a variation off of Craig Mathews' Serendipity pattern substituting Krystalflash for the White Deer Hair wing. 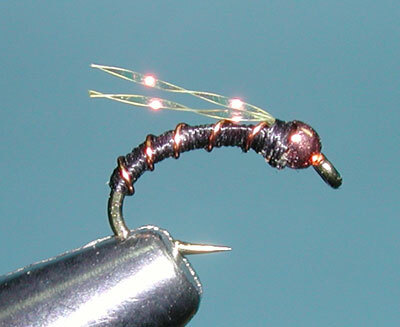 Colorado Guide, Pat Dorsey, created another midge pattern using copper wire, black thread, and black beaver dubbing with a crystal glass bead, naming it Mercury Black Beauty. Local Guide, Tom Loe of Sierra Drifters, often refers to the Crystal Zebra and the Crystal Tiger. These are basically variations of the Zebra and Tiger Midge in the emerger stage, using Krystal Flash as a trailing shuck. Mike Mercer came up with another variation, his Zebra Midgeling utilizing microtubing for the body with an underbody of Pearl Krystal Flash. He also incorporates a Krystal Flash wingcase. The microtubing gives a nice translucency to the body. Mike ties it in Black, Brown and Olive colorations. Normally, I like to use a tandem set of zebra midges, 12-18 inches apart. Since trout usually pick off the chironomids near the bottom, the dropper midge should reside about six inches off the lake bottom. An indicator is used to indicate a hit but also to help establish depth control. Midging is particularly effective when fishing in less than 10 feet of water, although depths up to 14 feet might be necessary. Chironomids prefer muddy lake bottoms. They burrow into the mud but are often above the bottom surface during migration and hatching. The larvae are known to migrate during the Spring seeking warmer water. During the Summer, the larvae will do the reverse and seek deeper, cooler water. Often the hatches will follow this temperature flow by hatching in the shallower waters during the morning hours and hatching within the deeper waters during the late morning or early afternoon. 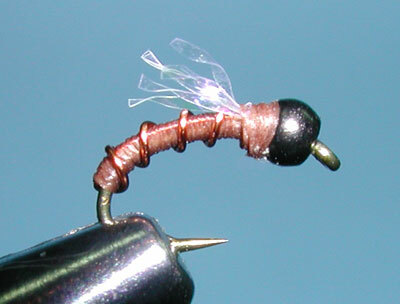 Try imitating the Chironomid stages by using a larva pattern as the dropper below a bead-head pupa. 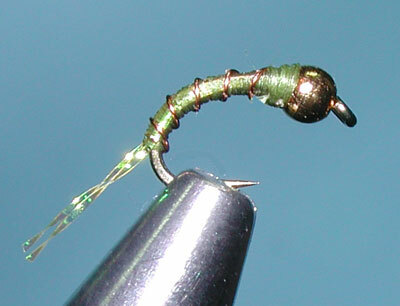 Through the middle of the hatch, try using the bead-head pupa as the dropper below a bead-head emerger. A small split shot between the two flies will help keep tension on the leader and will result in improved hook-ups. A sight twitching action with pauses will give the zebra midge slight action and is often very effective. A slow retrieve using a hand twist is popular. When fishing these rigs, always maintain a straight flyline. Strikes may be subtle and you need direct line control to set the hook. The depth upon which the fish are feeding can range from the bottom to the surface. If there are rises showing, try an emerger pattern without any weight, to keep the midge just below the surface. Keep an eye out for hatches, they can happen at any time. For a Chironomid larvae on a floating line - 6-8 seconds for each full hand-twist, give several 2-3 inch draws every 25-35 seconds. 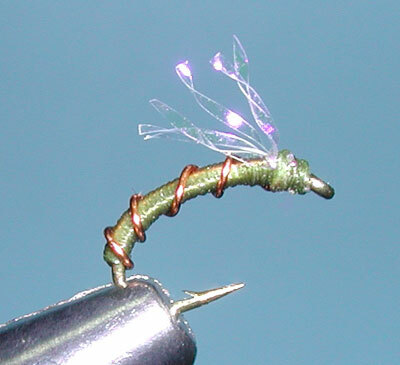 For a Chironomid pupa on a floating line - Get the line straight, then a full hand-twist every 4-8 seconds, every 35-40 seconds use a quick 2-3 inch draw or two with occasional pauses of 10-20 seconds. 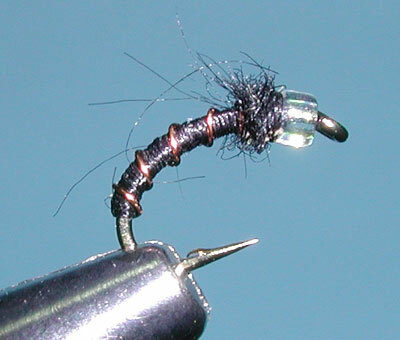 For a Chironomid pupa on a Type III sinking line - Allow the line to hang straight down, then a full hand-twist every 4-8 seconds, every 35-40 seconds use a quick 2-3 inch draw or two with occasional pauses of 10-20 seconds.